This downloadable booklet is a step by step workbook for you to complete, allowing you to leave detailed written instructions to future care providers for your special needs loved ones. As the current caregiver for a disabled loved one, you are intimately familiar with your loved one's background, daily routine, medical history and medications, doctors, teachers, preferences, likes and dislikes, favorite activities and people, present and future housing and care arrangements, etc. Unfortunately, most caregivers keep that knowledge to themselves in their heads. You are your loved one's daily advocate and care provider. Memorialize what you know about your special needs loved one for their next caregiver and complete a written Letter of Instructions for your Special Needs Loved One today. 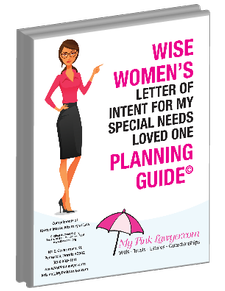 Please note: By downloading this free planning guide, you also agree to receive future emails from My Pink Lawyer® that may be of interest to you. We hate spam as much as you and we promise to keep your information private. You may opt out of future emails from us at any time.